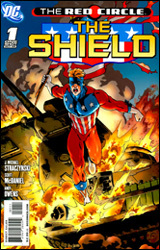 The Shield is the last in a series of four one-shots to introduce a historical character from the heyday of the MLJ (Archie) Comics superhero division into the modern DC timeline. Basically a modernized Captain America with a twist and a few additional abilities, our hero was airlifted from certain death on an Afghan battlefield and used as the guinea pig for a radical new suit of military armor. In theory, the nano-machines that comprise this soldier’s new suit would be summoned and retracted by his thoughts and actions, but seeing as how his wardrobe is the only thing presently keeping him alive, it may be a while before he’s ready to test the waters with that particular feature. Which, I guess, would actually make this a sort of three-way marriage between Cap, Iron Man and the Six Million Dollar Man. Try as he might, J. Michael Straczynski still has a hard time moving the character too far away from his somewhat cheesy golden aged roots. The techno babble may have been modernized, the scenery shifted from Germany to the Middle East, but the core of the character himself is still somewhat antiquated. Perhaps the brevity of a single issue lifespan has forced Straczynski’s hand, leading to a few of the seams showing in his storytelling, but this simple origin tale feels a bit too rudimentary and straightforward. Too many questions are answered with too much certainty, leaving very little unrevealed about the man, his superiors and the suit itself. If this was merely intended to be a teaser, why don’t I have much of an appetite for the main course? I used to adore Scott McDaniel’s artwork when he was a regular on Nightwing about a decade back. He gave the series an energetic, youthful vibe that was grounded with a certain degree of maturity. It wasn’t just another Batman spinoff when he was around, it was the next step of a natural evolution for current and former members of the extended Wayne family. That element was lost for good when he left the series for another project, and as fate would have it, I haven’t kept up with his work since. Not a lot has changed. While he endures a few struggles throughout the issue, particularly in its opening pages, it’s not long before McDaniel finds a sweet spot and resumes churning out his excellent, exciting brand of visual work. I may not care much for the character’s costume, which is bright, cheery and unabashedly patriotic, but it’s easy to overlook that when McDaniel has him lifting tanks and punching out aircraft with such mesmerizing grace and astonishing ease. Still, The Shield is average at best. It’s got a decent, if not original, basic origin in place, a natural eventual conflict built right in and a few eccentricities to set it apart from the books it’s likely to be immediately compared with. The lead character is certainly no Steve Rogers; he’s more ruthless in battle and less headstrong a personality, and he’s missing the charm and flavor of his storied Marvel counterpart. In short, he’s less suitable to carry an entire series on his shoulders. This isn’t bad, but it’s also far from great and some aspects of the story feel particularly watered down. Flip through it for the better moments of Scott McDaniel’s artwork if nothing else.